Last week, I asked if President Obama would throw Secretary of State Hillary Clinton under the bus as a consequence of the tragic errors that left US Ambassador Chris Stevens vulnerable to attack in Libya. Today, on the eve of President Obama’s second presidential debate with Mitt Romney, Secretary Clinton dutifully fell on her sword. While Secretary Clinton’s action neither absolves the Administration of responsibility nor ends the congressional inquiry, it does take the issue off of the table for tonight’s foreign policy debate between President Obama and his GOP challenger, Mitt Romney. Romney has tried to politicize the tragedy in Benghazi, Libya as proof of Mr. Obama’s foreign policy naivete. But families of the Ambassador and the three other Americans killed that day have rebuked Romney for using their deaths to score political points. Because of her action, Secretary Clinton’s stock has risen with me. What about you? Does today’s action by Clinton cause you to reconsider her rumored bid for the White House in 2016? 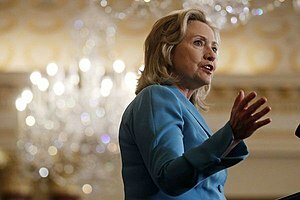 Read more – Libya Attack: Clinton Claims Responsibility For Libya Consulate Security. This entry was posted in Counter-Terrorism, Foreign Policy, Presidential Politics and tagged Benghazi, Chris Stevens, Hillary Clinton, Libya, Mitt Romney, President Obama, United States Department of State. Bookmark the permalink. I AGREE BIG TIME. I never thought I would have something good to say about a Clinton, but this move pre next debate is timed to serve her boss not her future ambitions. Her stock is up–way up! Hilary did the correct thing to de-politicize this story. Romney is wrong for not standing behind the President during a time of national mourning, they just don’t care. As for the news media, they act like everything has to go on their timetable. An investigation of an attack in a foreign land CANNOT be done within hours, or even days, like news cycle deadlines. It takes time. And the media played right into Repub plans by grilling the President about the speed and pace of the investigation. They need to stop.